• People on a statin should be advised to seek medical advice if they develop muscle symptoms (pain, tenderness or weakness). If this occurs, creatine kinase should be measured. •Creatine kinase should not be routinely monitored in asymptomatic people who are being treated with a statin. • Baseline liver enzymes should be measured before starting a statin. Liver function (transaminases) should be measured within 3 months of starting treatment and at 12 months, but not again unless clinically indicated. • People who have liver enzymes (transaminases) that are raised but are less than 3 times the upper limit of normal should not be routinely excluded from statin therapy. • If a person develops an unexplained peripheral neuropathy, statins should be discontinued and specialist advice sought. 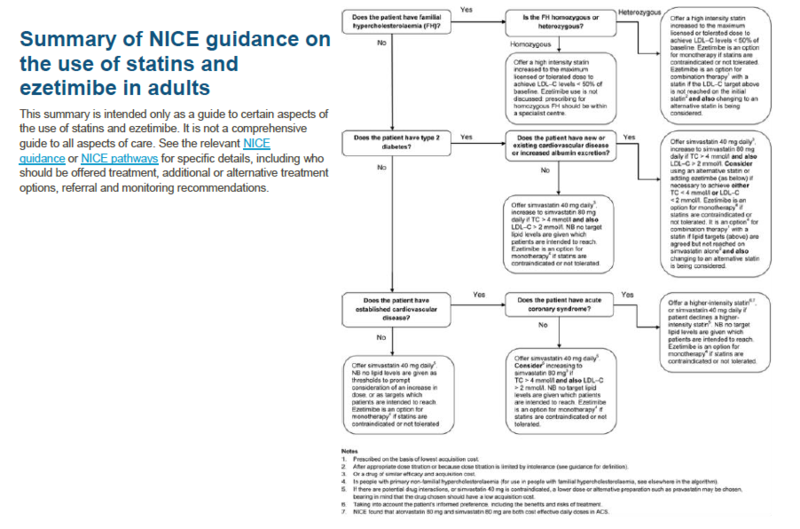 It is recommended that attempts should always be made to get patients to national cholesterol levels with statin monotherapy, using all formulary statins, before consideration is given to adding in or changing to another agent. A summary of drug–statins interactions is included in this chapter. • Simvastatin should be prescribed at night to optimise effect. 40mg tablets: £1.37 It should be noted that the maximum reduction in total cholesterol which can be expected from Pravastatin is 24%. However, pravastatin is not liver metabolised like the others, which may explain why it is generally better tolerated. 40mg tablets: £29.69 Higher intensity statins should not routinely be offered to people for the primary prevention of CVD. A target for total or LDL cholesterol is not recommended for people who are treated with a statin for primary prevention of CVD. Rosuvastatin is contra-indicated in patients with severe renal impairment (creatinine clearance <30 ml/min. The 40mg dose is contra-indicated in moderate renal impairment (creatinine clearance < 60 ml/min). Pravastatin and Rosuvastatin have a different metabolic pathway so may be tolerated when Simvastatin or Atorvastatin are not. Other lipid lowering drugs In general, the evidence for an effect on outcomes is less robust than for statin therapy. Additional monitoring may be required, particularly when Fibrates or Nicotinic Acid are used in combination with statins, due to increased risk of myopathy. Ezetimibe 10mg tablets: £26.31 Ezetimibe monotherapy is recommended as an option for treating primary (heterozygous‑familial or non‑familial) hypercholesterolaemia in adults in whom initial statin therapy is contraindicated. 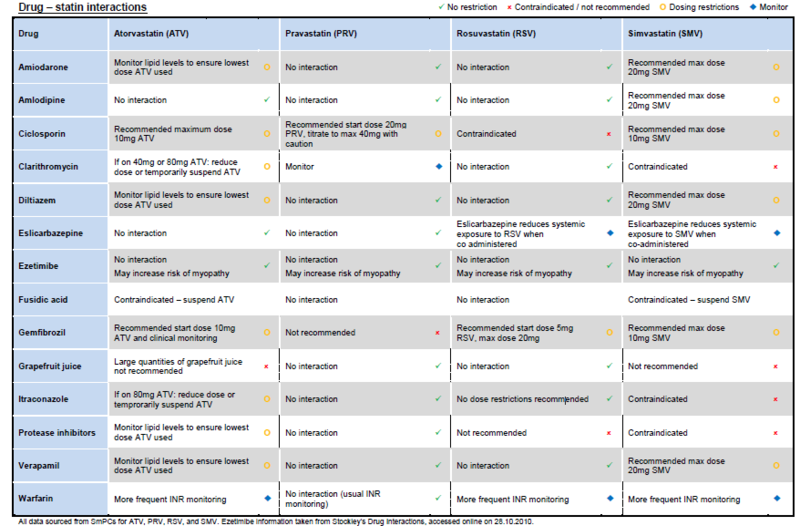 Ezetimibe monotherapy is recommended as an option for treating primary (heterozygous‑familial or non‑familial) hypercholesterolaemia in adults who cannot tolerate statin therapy, defined as the presence ofclinically significant adverse effects that represent an unacceptable risk to the patient or that may reduce compliance with therapy. 2. a change from initial statin therapy to an alternative statin is being considered. Healthcare professionals should offer adults with FH a referral to a specialist with expertise in FH if treatment with the maximum tolerated dose of a high-intensity statin and ezetimibe does not achieve a recommended reduction in LDL-C concentration of greater than 50% from baseline (that is, LDL-C concentration before treatment). Local specialist advice is to also consider checking triglyceride levels & consider fibrate. The ENHANCE study showed the addition of Ezetimibe had no effect on primary or secondary endpoints and emerging evidence contributes to lack of positive cardiovascular outcomes with ezetimibe alone. • people with type 2 diabetes. Nicotinic acid Specialist recommendation ONLY These lipid lowering drugs are usually initiated in secondary care by clinical biochemists for patients with complex dyslipidaemias. Tredaptive (Nicotinic acid + laropiprant) withdrawn from market Jan 2013. HPS2-THRIVE trial failed to show reduced risk of CV events & incidence of serious adverse events in the treatment group was higher.